You're viewing our De-Buyer Mineral B Element round fry pan. De-Buyer's round fry pan with a Lyonnaise profile enables food to slide easily from pan to dish. The commercial fry pan is designed for browning, searing and grilling. Mineral B Element utensil in heavy quality iron coated with beeswax, the coating is an organic protective finish that helps with seasoning the pan and protects against oxidation. The fry pan has enhanced, natural non-stick qualities when used, creating gradual seasoning in the pan and making it a perfect choice for caramelization of food. Ergonomic, riveted handle curved in French-style, designed for easy handling as you cook. Care: Do not use detergents or put in the dishwasher. Deglaze, rinse with warm water, dry and oil lightly. Store fry pan in dry place. Can be used on all cook tops including induction. Made in France. 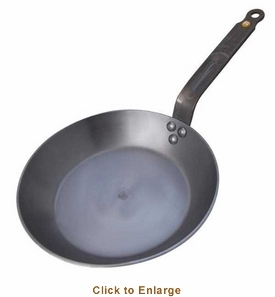 Our De-Buyer Mineral B Element round fry pan comes with a helper handle and a manufacturer warranty. We can answer any questions you may have about our products.